This is apparently a Mitsubishi Triton, but don’t ask what colour it is. Usually seen: Any rural road, either tarsealed or gravelled. Sometimes seen parked outside agricultural supplies shops and supermarkets in small towns. Frequently seen bumping over fields and farm tracks. Description: The farm ute is seldom seen in built-up areas, usually because the farmer will pinch the family saloon (aka the wife’s car) to head into town wearing good clothes. The ute is purely for business, and that business involves doing things with crops and uncooperative animals. Looks do not matter when it comes to the farm ute; in fact, if it looks pretty, it’s suspicious. Two main factors make a farm ute what it is: the mud and the flat deck out the back. If it hasn’t got these, it’s not a farm ute. The mud may get onto the farm ute in a number of ways. It may get kicked up from the surface of a gravel road or a farm track, or it may get splattered onto the sides of the machine by wet dogs, runaway bullocks and a range of farm implements. 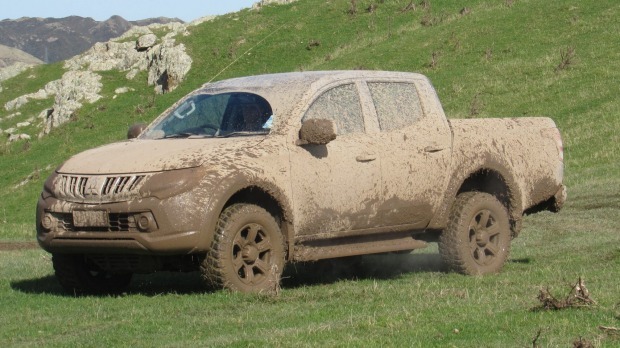 The mud is a semi-permanent fixture on the ute, especially as the closest the farm ute ever gets to a car wash is when it gets driven out to inspect the irrigation system or when it rains. If you are squeamish, don’t inspect the mud too closely, as some of it may be animal crap. If you are squeamish, you really don’t want to take a look at the flat deck itself. This will definitely have animal excretions on it of all varieties. You will also not be able to get close enough to the deck to inspect it, as it is likely to have at least one dog standing on it, chained to a set of bars behind the rear window. Other animals likely to be found on the flat deck include sheep (live), calves (live), pigs (dead after a hunting trip) and cattle (dead and sometimes in bits). The flat deck is also likely to contain miscellaneous sacks of animal feed, seed or fertilizer, and a selection of coils of wire, spades, crowbars, ropes and other tools. The whole point of the ute, after all, is to carry more stuff than the tractor, motorbike or quad bike does, as well as usually being road-legal, meaning that if the farmer needs to go down the road from farm block to farm block, or to the agricultural supply store to pick up the jumbo-sized sack of dog biscuits, a new elastrator and a salt block or two. Utes may be twin-cab or single-cab, although single-cabs are more common. Double-cabs tend to be used when there’s a crew of workers to be lugged around or if there’s a heap of stuff that shouldn’t get wet or muddy, such as grass seeds or chemical sprays. Double-cabs tend to be a kind of mobile toolshed. Even in a single-cab ute, the front seat is likely to hold random bits of paperwork as well as a lunchbox and thermos flask – where the dogs can’t get at it. The interior will also be muddy. Bells and whistles are also in short supply inside the farm ute. GPS systems are useless, as even the most sophisticated ones aren’t going to tell you the shortest way from the cattle yards to Field 3 in D Block. Any rear parking cameras are going to be covered in mud before too long, so they’re no good, either. Must-haves in the farm ute are the radio (so you can listen to the cricket while mending fences) and the horn (for turning the ute into a sort of mechanical dog that barks to move stock along). The farm ute may or may not have 4×4 capacity, although it frequently does. This is because the typical farm ute usually sees more off-road action than many fancy 4x4s. Fancy 4x4s – the ones that look like they had a military origin along the lines of Jeep and Land Rover – are never used as farm utes. This is because they lack the all-important flat deck.